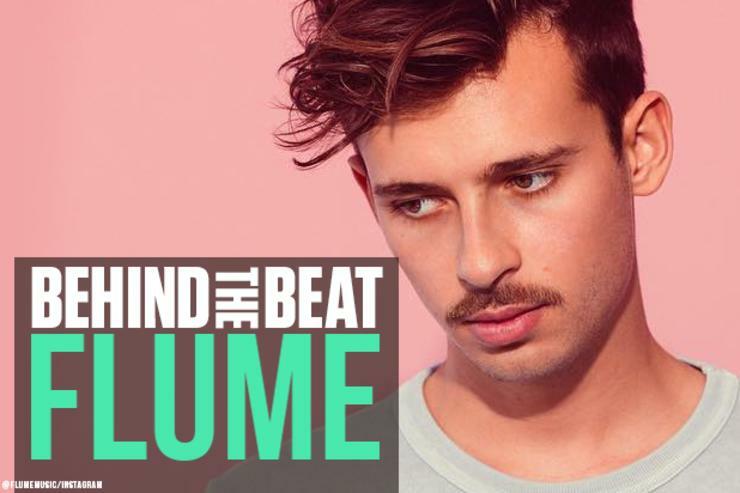 INTERVIEW: Australian producer Flume explains how J Dilla and Flying Lotus changed his life. Using free music software he’d found in a cereal box, Flume launched into a maximalist techno groove -- a punishing 4-on-the-floor kick, robotic wubs, and cataclysmic synths, the sound of a Godzilla-like giant sausage dispassionately laying waste to Tokyo. Flume was 12 at the time. HNHH recently met with the 24-year-old version of Flume at his hotel room on the west side of Manhattan 10,000 miles away from the childhood home outside Sydney, Australia where he conceived “Hectic Sausage.” He had recently kicked off a North American tour in support of his sophomore album, Skin. Killian, who has joined him on the tour as a roadie, was elsewhere in the hotel. During the interview, nothing about Flume’s demeanor or appearance suggested that he is one of the most popular electronic artists in the world. He gave unpretentious and thoughtful answers. He wore a purple cap, plain yellow T-shirt, khaki shorts, and a bare upper lip where a moustache once lived. He was simply Harley Edward Streten, and Harley he would remain until he stepped on stage the next night at Queens’ Forest Hills Stadium under the nom de guerre Flume. Flume first made a splash in 2012 when he released “Sleepless,” a track that combined sliced and stretched female vocal riffs with harmonious, undulating synths. It presented a refreshing alternative to progressive house and dubstep, which were prevalent at the time. What’s more, it may have struck a nerve with young listeners anxious about the ways in which technology has become increasingly integrated into the fabric of everyday human life, whether it be virtual reality, wearable tech, consumer preference algorithms, or Siri. Flume’s stated musical purpose is to explore the nexus between the organic and the synthetic, and his style would prove immensely popular as he established his sound on his acclaimed self-titled debut album in 2013 and expanded upon it with Skin. Over the course of his interview with HNHH, Flume explained how listening to J Dilla and Flying Lotus engendered a musical epiphany, helped him break out of the 4/4 house mold he grew up on, and helped him to begin to imagine a more fluid form of electronic music. Artistic epiphanies are not uncommon. Robert Johnson met the devil at the crossroads and sold his soul to become a master of the blues. Charlie Parker realized he could superimpose complex harmonies on top of existing chords. Flume grew up listening to Daft Punk and DJ Hixxy’s “gabba” sugar overdose house music. He never listened to much hip hop until he came across J Dilla’s Donuts andFlying Lotus’ Cosmogramma and Los Angeles towards the end of high school. Their willingness to color outside the lines, toy with irregular grooves, and embrace experimentation and imperfection was nothing short of revelation. Flume began as a side-project, but once those songs started winning contests and earned him a deal with the independent label Future Classic, it became his focus. His debut album Flume, completed on his laptop during a three-month backpacking trip through Europe and released four days after his 21st birthday, essentially used the wonky rhythms and spirit of experimentation he had absorbed from Dilla and FlyLo to deconstruct house music, while diving deeper into the infinite world of synthetic sounds. For the next album, Skin, Flume added one more element to the mix: rappers. By working with Vince Staples, Vic Mensa, Raekwon, & Allan Kingdom, he not only changed the surface complexion of the album, but gave himself a new challenge that changed his fundamental approach to music-making. “I was a big fan of Summertime '06. I liked his demeanor and what he was about. He's hilarious, he's not trying to put up a front. He's got an amazing tone as well. Cool voice. "Hip hop, or more human"
In his own words, Flume is on a quest to make sounds never before made or heard in the history of mankind. It is a noble quest, not for the faint of heart or imagination. It requires guidance, and Flume proceeds with his electronic heroes standing on his right shoulder and Dilla and FlyLo on his left. "The thing is, I love the tones and textures of dance, techno, trance music," he said. "I love the feeling, I just don’t like the vehicle it's delivered in. What I love about hip hop are the rhythms and the sway of it. It feels like it's got soul and it's alive. Sometimes I feel dance music is missing a live element. So what I draw from hip hop is that feeling, and I try to put that feeling in the context of heavily electronic music. So the sounds are super synthetic, but the feeling is hip hop, or more human."